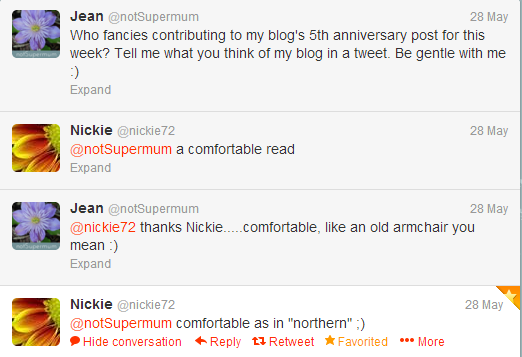 notSupermum: 5 years of blogging, making friends and getting abuse on twitter...where did the time go? 5 years of blogging, making friends and getting abuse on twitter...where did the time go? I started this blog in May 2008, and although the first 6 months worth of posts have been deleted (don't ask) and I took a couple of short breaks it's been a continuous stream of nonsense ever since. What started off as a place to rant about this, that and the other has become...well, actually it's still the same but with a bit of home decorating and gardening thrown in for good measure. We've had some brilliant adventures because of this blog - Los Angeles, Milan, Cologne - and met some amazing people, many of whom have become real life friends (you know who you are!) I would never have dreamt that the blog would have such a big, positive impact on our lives, but it has and I'm very grateful. 'I started reading notSupermum's blog more years ago than I can remember and it's been on my list of top blogs to read ever since. I'm not sure nSM realises what an excellent writer she is, or how helpful I've found it to read her blog as a fellow single patent. It takes commitment and perseverance to make your 5th blogging anniversary. Many congratulations to nSM. Looking forward to the next five blogging years and much continued success. I've also been inundated with had a couple of messages on Twitter. I asked if anyone could sum up my blog in a tweet. I remember when I decided to start this blog, and after writing the first few blog posts wondering "Who on earth would ever want to read this?" And if I'm perfectly honest I still ask myself the same question every week, but here you are and thank you. THANK YOU! Here's to another five years of mad adventures, making new friends and getting into trouble on twitter! The May garden ~ rain, rain and more rain. The £50 Room for Improvement challenge is on! The garden in May ~ How does your garden grow? When are kids too old for a family holiday?